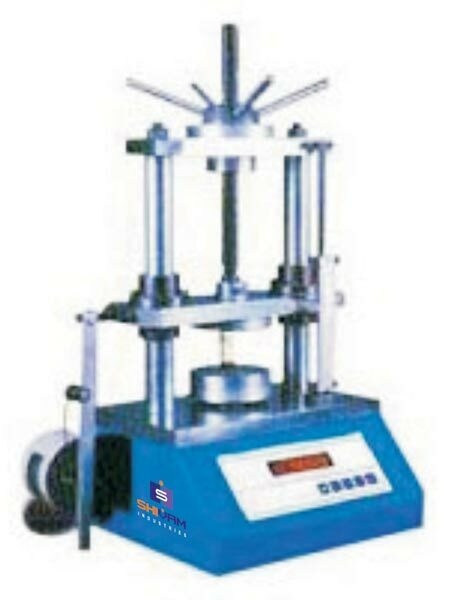 SHIVAMâ��s Spring Testing Machines are used for quick and accurate testing of tension and compression springs. The Spring Testing Machine comprises of two hand-chrome plated columns with fine cut single screw and hand wheel for manual loading as well as unloading arrangement. Our Spring Testing Machine uses a high precision-load cell for measurement of force. For displacement measurement, mechanical linear scale or digital vernier caliper or rotary encoder is used. Measuring system of Spring Testing Machine is based on latest microprocessor based electronics with tare facility. We manufacture and supply Spring Testing Machine across the nation. Force measurement accuracy + 1% of indicated load or 0.5% of full load value whichever is higher. Maximum Capacity 20 Kg., 10 Kg., 5Kg. 200 Kg., 100 Kg., 50Kg. 300 Kg., 500Kg. Force Measurement Resolution 1 gm 10 gm 0.1 kg.